From the same notebook I got a tiny trackball. It has a logitech controller IC on it which I originally wanted to interface (because it appeared as a separate COM port to the notebook when it worked or so I heard and I thought it must have serial signals then) but since I found no datasheet(Logitech 330069-00) and any attempt at hooking it up to the serial port without a MAX(3)232 failed I discarded the idea. However I did have a ball mouse handy that I hated since the day I got it. It was a Micro$oft Wireless Desktop Wheel Mouse (and there's probably "intelli" in it's name somewhere) the worst mouse I ever owned. This mouse made me hate wireless mice, if I didn't touch it for 5 seconds it went to sleep, and it didn't automatically reconnect. So using it was 90% picking mouse up, pushing connect button, putting mouse down. Drove me crazy after a while. So it's perfect for this utterly pointless small project. 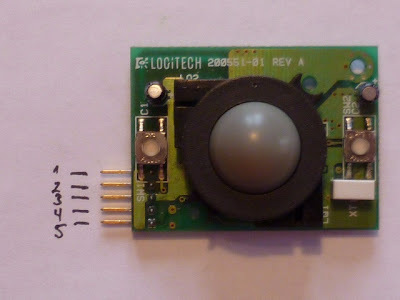 Stefan Radke has managed to map the pinout of a Logitech laptop trackball from a Compaq Contura 400CX. 1 - GND, 2 - GND (3), 3 - Vcc(4), 4 - Data(1), 5 - Clock(5). Numbers in () are PS/2 pins. It's real close but not entirely the same design as the one I had to play around with. I suspect most of these will have PS2 (or perhaps serial) connections for the older ones and possibly USB for newer ones though, so direct hookup for use in random projects (CarPC, etc..) should be possible. Hi, I managed to interface the Logitech 330069-00 chip today with using AT90USB162 chip. I used LUFA HID mouse library with a little addition of my own code for decoding the Logitech chip. It works great.